This MAb recognizes basic (Type II or HMW) cytokeratins, which include 67kDa (CK1); 64kDa (CK3); 59kDa (CK4); 58kDa (CK5); 56kDa (CK6); 52kDa (CK8). Twenty human keratins are resolved with two-dimensional gel electrophoresis into acidic (pI 6.0) subfamilies. The acidic keratins have molecular weights (MW) of 56.5, 55, 51, 50, 50, 48, 46, 45,, 40kDa. This MAb recognizes the 65-67, 64, 59, 58, 56,, 52kDa keratins of basic subfamily. Many studies have shown the usefulness of keratins as markers in cancer research, tumor diagnosis. 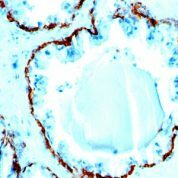 SPM115/SPM116 is a broad spectrum anti pan-keratin antibody cocktail, which differentiates epithelial tumors from non-epithelial tumors e.g. squamous vs. adenocarcinoma of the lung, liver carcinoma, breast cancer,, esophageal cancer. 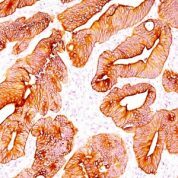 Variations in Cytokeratin antibody staining intensity in immunohistochemistry on tissue sections are present across different anatomical locations. 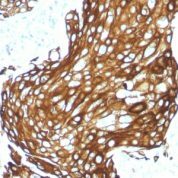 Low, but measureable presence of Cytokeratin could be seen in. We were unable to detect Cytokeratin in other tissues. Disease states, inflammation, and other physiological changes can have a substantial impact on antibody staining patterns. These measurements were all taken in tissues deemed normal or from patients without known disease. 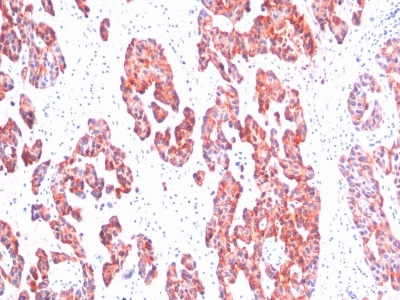 Tissues from cancer patients, for instance, have their own distinct pattern of Cytokeratin expression as measured by anti-Cytokeratin antibody immunohistochemical staining. The average level of expression by tumor is summarized in the table below. 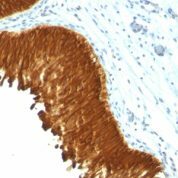 The variability row represents patient to patient variability in IHC staining. enQuire Bio's Cytokeratin, Basic Anti-Human Monoclonal is available for Research Use Only. 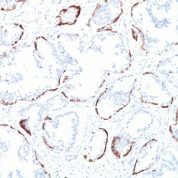 This antibody is guaranteed to work for a period of two years when properly stored.